This unique rope porch set won’t sacrifice comfort for beautiful styling. With a breathable open weave, our Palmetto Set is the perfect fit for your outdoor entertaining. 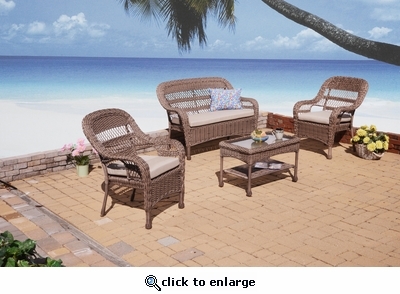 Constructed for "All Weather" use, this set is made of woven polyresin vinyl over a sturdy aluminum frame. Includes cushions in choice of indoor/outdoor fabric. Sunbrella fabrics available for an additional charge. Available in a Dark Driftwood finish.